Lily is 84% NFQHA (F0032130). 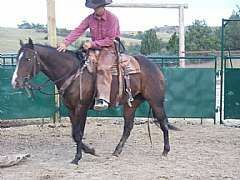 This mare is registered as brown, but in our opinion she is really a beautiful dark bay. She has just enough white on her face to make her noticeable, but solid legs with black feet. 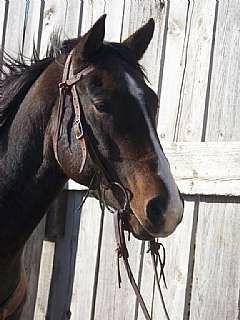 She is one of five fillies that we purchased from Grantier Quarter Horses as a weanling. You can read more about her sire on our main mares page and more about her bloodlines on our horse history page. She's got Zan Parr Bar bottomside and Jet Deck and Leo Scamp just off her papers topside. 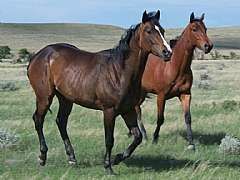 She has the same mare line as some of our proven saddle horses. In addition to that, she goes to King P-234 a fantastic 7 times! Lily is a big, leggy mare that is muscular and stout and yet feminine. At age 5 she has matured to a solid 16 hands. Lily was started under saddle summer/fall 2009. 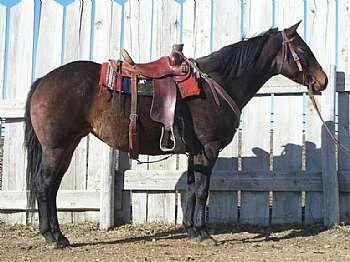 Looks certainly aren't everything, but she is a mare that really looks good under saddle. These pictures were taken 2 year old summer and 3 year old fall. We will add more of her from this summer with her foal. Lily foaled a really nice bay filly, Princess Leia Reed. We are having a little fun with Star Wars names on some of our foals this year. Little Leia is definitely the princess out in the pasture. Leia is her first foal and is by JK Jay Reed. Lily foaled a black filly, Lily Dancer Reed JW in 2012. All of her foals with JK Jay Reed will be 9.79% and 13 times to King P-234, 90% foundation eligible and HERDA N/N because both dam and sire are N/N. Lily was pasture exposed to "Pine Cone" again for 2013 and had another beautiful black filly, Jitterbug Reed JW. She was exposed to our perlino stallion, Walter O Rielly aka Radar for 2014 and had a leggy stout stud colt, Lily King Drift JW. This is her first foal with Radar and he goes back to King P-234 a combined of 19 times, is 87% NFQHA eligible and Herda N/N because both dam and sire are also. We were so pleased with this foal that she was exposed to him again for a 2015 foal and we got us a filly, Lily Dancer Drift JW! We got a filly to keep for our program, so we are exposing her with TRR Paddys Texas Gin for a 2016 foal and she had a beautiful bay filly, Paddys Gin Nova JW. We are happy with what we got so we exposed her to 'Tex' again for a 2017 foal. Unfortunately Lily passed away with a complication. We are so incredibly sad to loose this great mare. We have retained a few of her daughters for our breeding program and very grateful we did.